The part 2 to my 2016 Road Trip with Miami Meat Machine guys have us staying 5 days in Columbus and then making our way home with stops in Kentucky, Tennessee, & Georgia to our final stop in Miami, Florida. B Spot (Columbus, OH) – Our first night we went to B Spot by Chef Michael Symon who’s got a couple of SoBeFest Burger Bash wins under his belt. I attended the Burger Bash where he won with the Fat Doug (topped with Slaw, Pastrami, Stadium Mustard & Swiss Cheese). I thought here’s an opportunity to try a larger version of the Slider I had enjoyed a few years back, great Burger. Both the Stadium Brat (Beer Brat w/Griddled Onions & Stadium Mustard) and Chocolate Shake w/Kahlua are worthy of ordering, you will love them. Dirty Frank’s Hot Dog Palace (Columbus, OH) – We stopped in at Dirty Frank’s a couple of times but I preferred what I ordered the first time around: a Chili Dog (Meat Coney Sauce, Fresh Diced Onions, Yellow Mustard & Cheddar Cheese), Puff The Magic Popper & the Cincinnati 4-Way (Spaghetti, Meat Coney Sauce, Cheddar Cheese, Diced Onions, Jalapeños & Sriracha Sauce drizzle). Jeni’s Splendid Ice Cream (Columbus, OH) – After hitting up Dirty’s Franks we knew that Dessert in the form of Jeni’s Splendid Ice Cream was in our future. A couple of Salted Caramel scoops on a house-made Waffle Cone was excellent. Tim Hortons Cafe and Bake Shop (Columbus, OH) – Our visit to Tim Hortons was a spur of the moment decision since I wasn’t able to eat there 5 years ago in New York. DJ Cow Money chose a Boston Creme, I ordered a few Timbits (Bite-sized Donuts) w/ a cup of Joe. The snacks did their job and we were off. Raising Cane’s Chicken Tenders (Columbus, OH) – I’m not sure how we did it but at our fourth restaurant in a row, we each got a Chicken Tenders Platter. I’ve got a big weakness for Chicken Tenders and knew I needed this in my life. There’s a plethora of Chicken Tender restaurants around Northern Florida and near College Campuses in the South Eastern States, Raising Cane’s ranks right near the top. The Thurman Cafe (Columbus, OH) – As punishment for leaving Gerther & DaChew behind on the 4 stop excursion, they head out to the Thurman Cafe. DaChew not only dares to order the Thurmanator (Lettuce, Tomato, Mayo, American Cheese, Provolone Cheese, Ham, Sautéed Onions, Mushrooms, Bacon, Cheddar Cheese, Hot Peppers & 2 – 12 ounce Burger Patties) but he eats the entire thing. The worst part is we’re never gonna hear the end of it from him. Still can’t over that we made it to KewPee Hamburgers, Dave Thomas’ inspiration for Wendy’s. 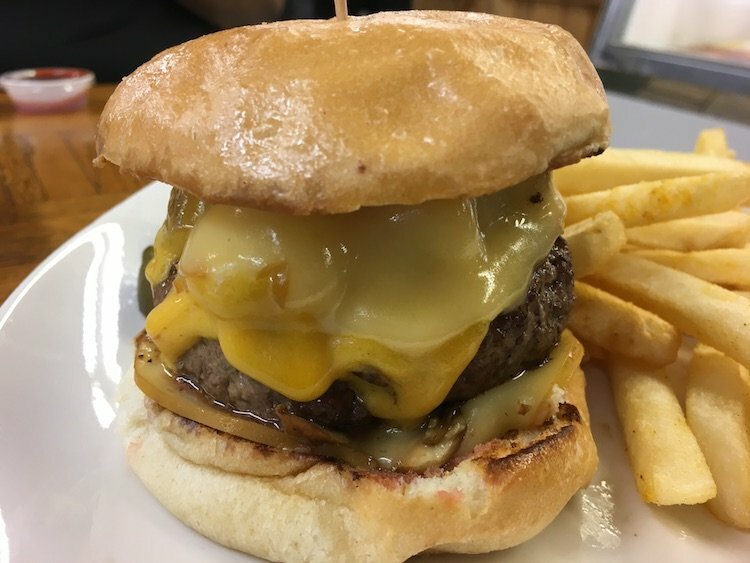 Read about the entire: KewPee Hamburgers Visit. Roxy’s Pizza (Millersport, OH) – We laid low on the last night in the Columbus area and picked up some Pizza, along with Cheese Bread and a Chicken Parm Hero from Roxy’s Pizza. It’s a good little neighborhood Pizza Joint. 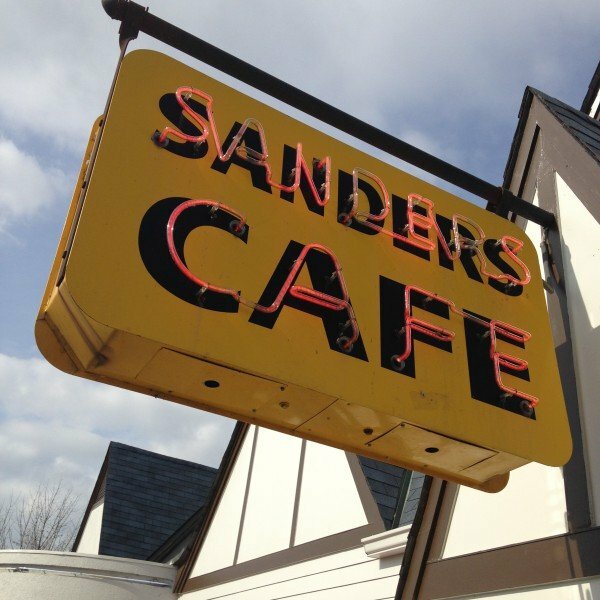 Sander’s Cafe (Corbin, KY) – It houses a museum of Colonel Sanders and Kentucky Fried Chicken Artifacts. Sander’s Cafe also houses a Kentucky Fried Chicken restaurant. It was right near here where the Colonel created his Fried Chicken in the early 1930s at Sanders Court & Café. A&W Drive-In (Madisonville, TN) – A&W opened their first Drive-In restaurant in 1923. This Drive-In isn’t that old but it’s been around quite a while so that meant we needed to pay it a visit. The experience of being at a real A&W Drive-In that’s stood the test of time enjoying a Burger and a Root Beer could never be replicated for me. But I’ll try again soon. Papa Burger – Two Burger Patties, American Cheese, Lettuce, Tomato, Onion, Pickles & their signature A&W Papa Sauce on a Toasted Bun. The Dwarf House (Hapeville, GA) – Staying on the historical tip we hit up the Hapeville Dwarf House, where Chick-fil-A started. The restaurant is half full service diner and half regular Chick-fil-A. We take a seat at the booth and I gotta order the Hot Brown (Chopped Chicken, Cream Sauce, Cheddar Cheese, Paprika & Bacon), the Sweet Potato Soufflé and a Cheeseburger. The moral of this story is to stay away from the Cheeseburger. The Varsity (Atlanta, GA) – No visit to Atlanta is complete without a stop in at the Varsity for Chili Dogs & Fresh Cut Fries. This time it was made extra special since my good friends Droolius & Odessa met up with us. Carroll’s Sausage & Country Store (Ashburn, GA) – A couple of years ago we stopped in at Carroll’s on our drive back to Miami. We had such an awesome time that we figured we’d attempt to duplicate it and did.